My community has been the focus of national and international news this week, for a horrible reason. You can imagine our concern as we hurriedly texted our son Preston, who is a senior at UNC-Chapel Hill, and our relief in discovering that he was alive and well. That relief never came to the parents of UNC dental student Deah Shaddy Barakat or the parents of his wife Yusor Mohammad Abu-Salha and her sister Razan Mohammad Abu-Salha. 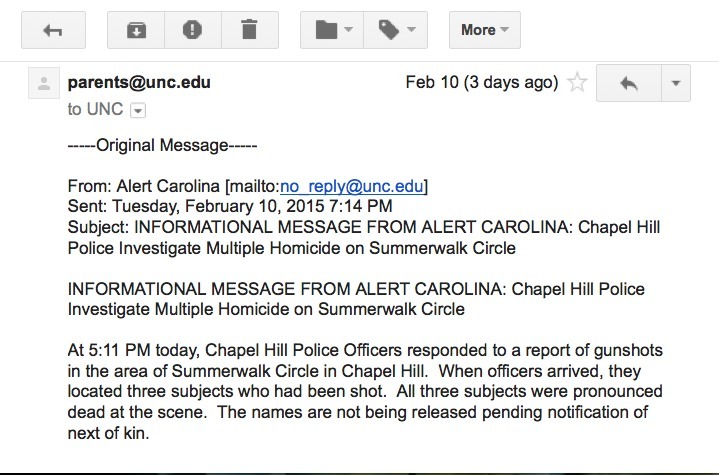 The site of the killings is about 15 minutes from my house, in an apartment complex close to the UNC campus. The scenery in this part of the world is lovely, almost idyllic--and usually peaceful. But not this week. This week our community has been shaken to its core by the actions of a criminal. As the story unfolds, we've learned that Craig Stephen Hicks, who turned himself in to police, has had long-running disputes with his neighbors over--get this--parking. Parking is, of course, a big deal around here. We live right in the middle of university country, with Duke University on one side and UNC-Chapel Hill on the other. With many thousands of students and thousands more faculty and staff, parking is at a premium in many parts of our community. The apartment complex where the victims and the killer lived had limited parking, and the killer had a history of becoming visibly angry over parking disputes. He had reported parking violations so often that a local towing company had finally made a policy of not responding to his calls to have cars towed. But seriously. . . parking? Mr. Hicks was angry enough about parking that he killed three people in cold blood? We may never know the issues lurking in this man's heart and mind. What little we do know so far comes in part from his own Facebook page, where he proclaims himself not just an atheist but an anti-theist. It would appear that he hated religions of all kinds. 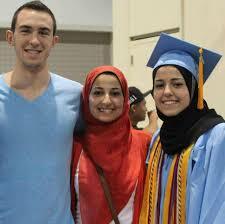 His victims were faithful Muslims, so perhaps his passions were fueled by hatred of their religion. A number of people around the globe have called upon American authorities to denounce the murders as "hate crimes," which are officially defined as "criminal offenses against a person or property motivated in whole or in part by an offender's bias against a race, religion, disability, ethnic origin, or sexual orientation" (www.fbi.gov). In this case, it would appear that the crime was motivated at least in part by the offender's bias against the fact that the victims were religious, although it's unclear whether he had a bias against their particular religion. As I've wept and prayed along with everyone else in this part of the world, I've reflected on the fact that the heart of the matter really IS hate. Whether this crime should officially be labeled a "hate crime" is for authorities to decide, but it is without a doubt a crime full of hate. "Hate" is a word that's bandied about often in our world. Perhaps I'm naive, but I'm always surprised how often the word "hate" is used in everyday conversation. Around here, fans of Duke University will say that they hate UNC, and UNC fans will say that they hate Duke. In fact, UNC's alma mater usually ends with the chant "Go to hell, Duke!" instead of "Rah, rah, rah!" While I understand intense rivalries, particularly in sports, I'm still amazed that such vitriolic verbiage is the norm. Of course, it's not against the law to hate. In a society like the U.S., where personal freedoms are guaranteed by the Constitution, people may hate something or someone as much as they like, provided that they do not act on that hate to do harm. But my heart is heavy at the thought of how much this atmosphere of hatred must grieve the heart of God and how much damage is done to our society when we not only tolerate but sometimes champion hate. As a Christian, my charge is clear. To love, not to hate, is my calling. In talking with His closest friends just before His death, Jesus said: "A new commandment I give to you, that you love one another: just as I have loved you, you also are to love one another. With such violent acts as those perpetrated in Chapel Hill this week, it would be easy for us simply to despair about the state of our world. But God calls us not to despair. He calls us to be world-changers, wherever we are. How? By loving God first and by loving our neighbors. All of them. #AllLivesMatter to God. I may not be able to influence public policy, but I can love my black, Latino, and Asian neighbors. I can love my Muslim, Buddhist, and Hindu neighbors. I can love my disabled neighbors. I can love my gay neighbors and my straight neighbors. I can even love those neighbors who choose to hate me because I am different from them. And in so doing, I can change my own little corner of the world. Even if hate still reigns in my community, there will be love mixed in. Thank God, I'm not left to try to summon up these traits under my own power. Neither are you. 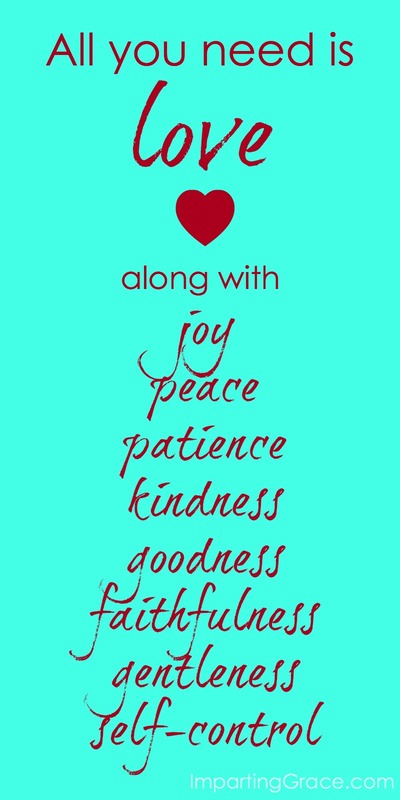 These things we need are the fruit of the Spirit that lives in us (Galatians 5:22). I'm convinced, even in dark days like this: hate will not prevail. Your post says it all Richella...beautifully put. We were in the Nashville, TN area when we saw this on the news....we just could hardly believe this happened right in our own backyard, so to speak. I can only imagine your feelings when you read that email. Sometimes I wonder how long the Lord will tarry but I know that only He knows when the perfect time will be. Thank you for this, friend. I still say "Rah, rah, rah!" I was an orientation counselor my sophomore year and that was strongly emphasized. That we model to NOT hate especially in our fight song! Kristin, I'm so glad to hear that orientation counselors at UNC are instructed to say, "Rah, rah, rah!" Somehow that comforts me a bit. I've heard so many people in this community declare vehement hatred for rival schools. It always shakes me up, especially when a Christian says it. I just can't see that the language of hatred is good for us. What a horrible situation in your city and a horrific moment of fear for your son. Although we haven't had a crime of that magnitude here, we read almost daily of race-on-race crimes. Perhaps they can't be labeled as "hate crimes" but they can be labeled as evil. I'm yet to see that label pass a vote in Congress. We must love for we all sin but apart from God there is no forgiveness. Thank you for reminding us that our job is to be perhaps the only Jesus someone may see. How terrible. Prayers for grace and peace for you and your community. Well said, Hatred will not make things better. Hope your community comes out stronger from this! Richella, i could not have said what my heart feels more eloquently than you did here. I live about 30 minutes down the road from you. We have truly felt the impact of the UNC community here these past few weeks. With the passing of Dean Smith, and now with these three precious souls. I pray the students feel the love of God and community as they mourn the loss of four so dear to many. I am that *other color of blue* and as competitive as the next, but hate is destroying us as a country. I pray God reveals His love and grace through articles like yours and many others for months to come. Thank you. Just thank you. I saw this on the news and started to cry and pray that God would ease the pain of those children's parents. Very well said Richella. I am in total agreement with you. We have let so much hatred get out of hand and we must "turn from our wicked ways" so that God can heal our land. We received the same email from UNC, as we have junior and senior sons there. Our boys quickly let us know they were fine, but my heart broke when I heard what happened to those three young people. I love Elizabeth's comment above, "We may be the only Jesus someone sees." On this day of love, I pray for peace for all the families involved in this senseless tragedy. What a thoughtful and articulate post. I pray for the victims and families of this horrible tragedy. We are in CT but my son is a freshman at Univ. of So. Carolina and there was a murder/suicide there last week. Very frightening. Oh, my, Richella--parking?? I hadn't heard that until reading your post. It makes a grievous tragedy all the more painful. I cannot imagine the soul that is so mired in hate that he/she is compelled to rob someone else of life. How broken a person must be to make that decision (and in this case, over something so ridiculous). There are plenty of moral people who lack a faith persuasion, so is anti-theist position can't be the only reason he would do such a thing. And here's the hardest part--we're called to love him, too! Oy. What does THAT look like? The timing of reading your post is interesting in a general sense; I have challenge myself to ask a question before I respond to others: "What would love do?" It's different than "What would Jesus do?" although, it's basically the same question, right? And the lovely thing is it's affecting my response! I've actually stopped myself from speaking and thought through that question on several occasions, and I'm stunned by how it changes my response. Indeed, we are called and commanded to love AND we're known by that marker! That, to me, might just be the best part--that a hurting world would notice a difference...and that difference would be the manifestation of Jesus in us. I feel your heart in this, friend.... Wisdom in the midst of tragedy.... A Divine word of encouragement.